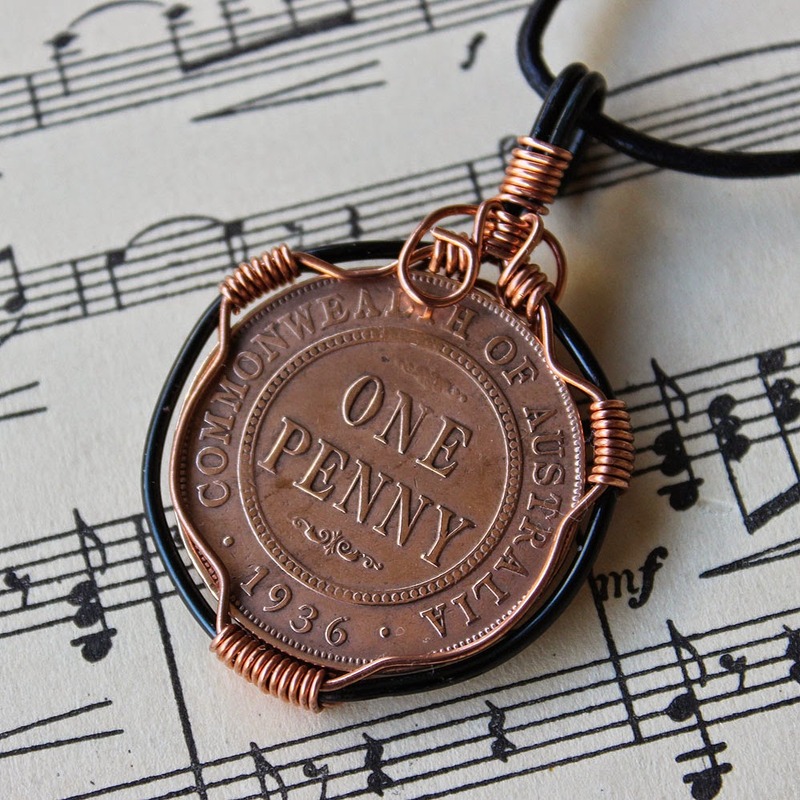 there were coins and copper wire. I thought I would do a little blog about the lovely old coins I am having so much fun with. 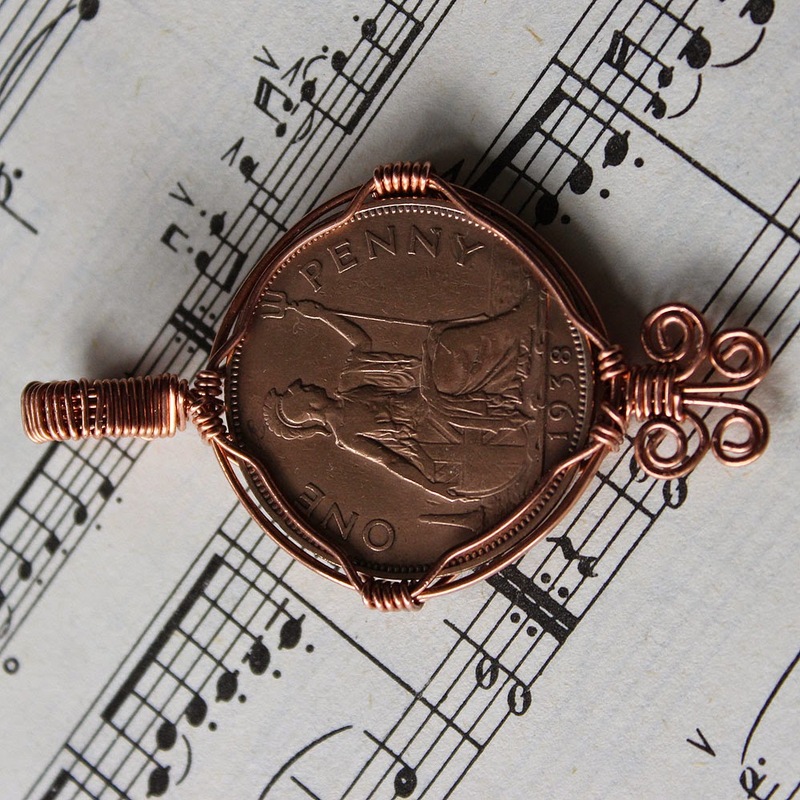 I can't remember how I started working with coins but they really inspire me and I am enjoying finding new ways to dress them up. We have bought in many kilos of coins (approximately 100 pennies to the kilo) in an endeavour to get as wide a selection of years as possible. In particular I love the pre 1900 coins with Queen Victoria as the crown head. I mainly work with Australian and English penny and half penny coins, but do have some from other countries as well. Australia didn't get her own currency until 1910/1911 until then we had the same currency as England. Australia stopped minting pennies etc in 1964 in readiness for the change over to decimal currency in 1966. 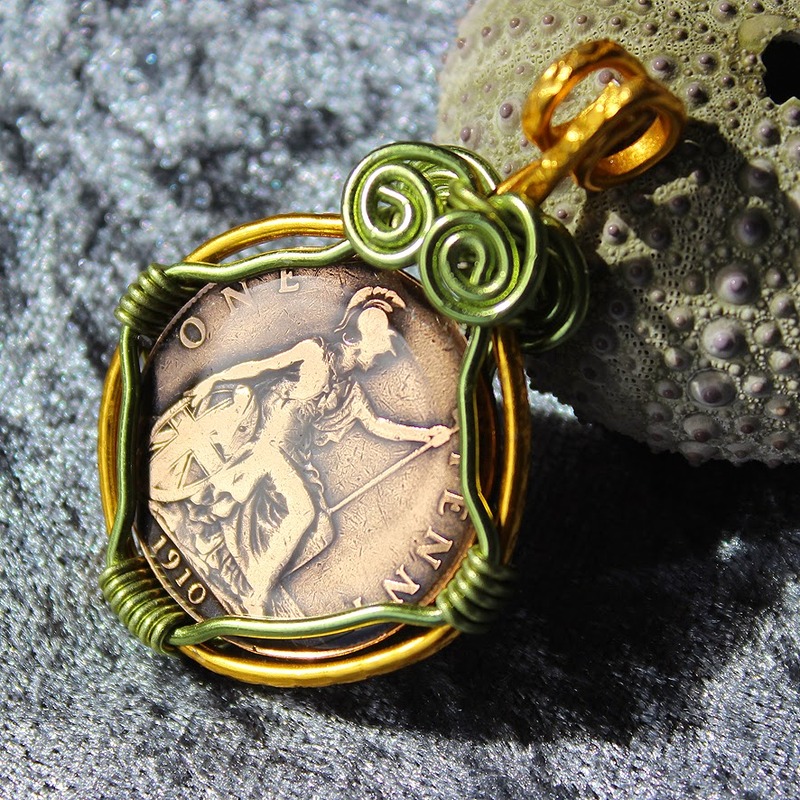 I first started by simply cleaning, polishing and wrapping with recycled copper wire, because the metals matched, but the age old problem of tarnish and dullness still happened. 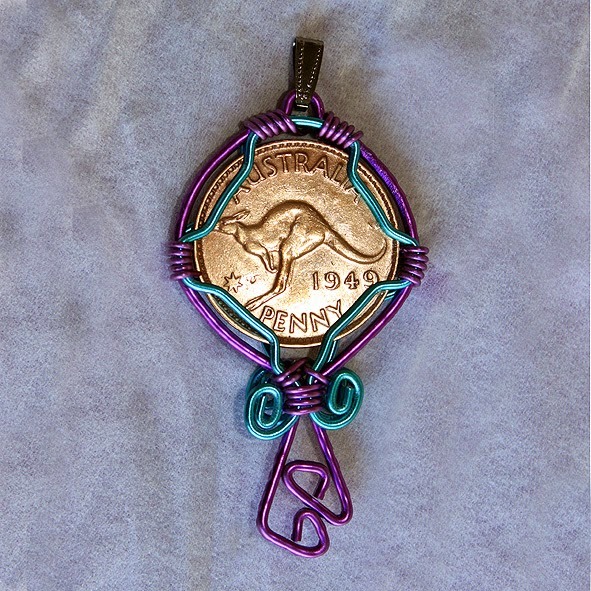 I also wrapped some with coloured aluminium wire and this gave me the ability to add colour to my coins. I often combined the copper wire with the aluminium wire to give contrast. 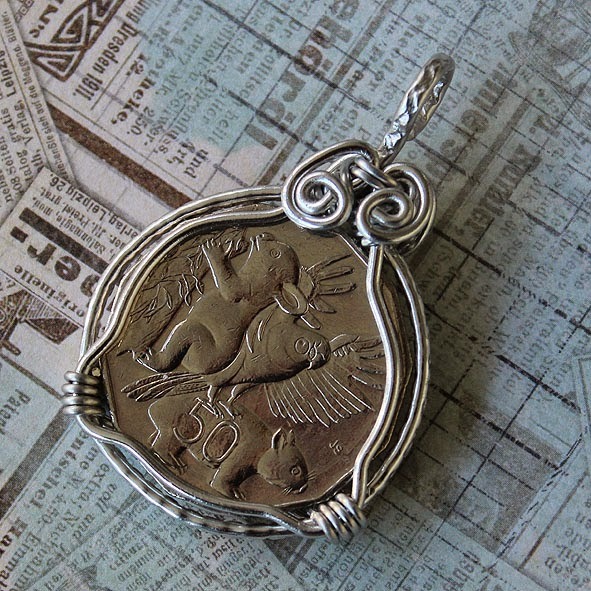 Silver coloured coins I would wrap with either silver coated copper wire or silver coloured aluminium wire. 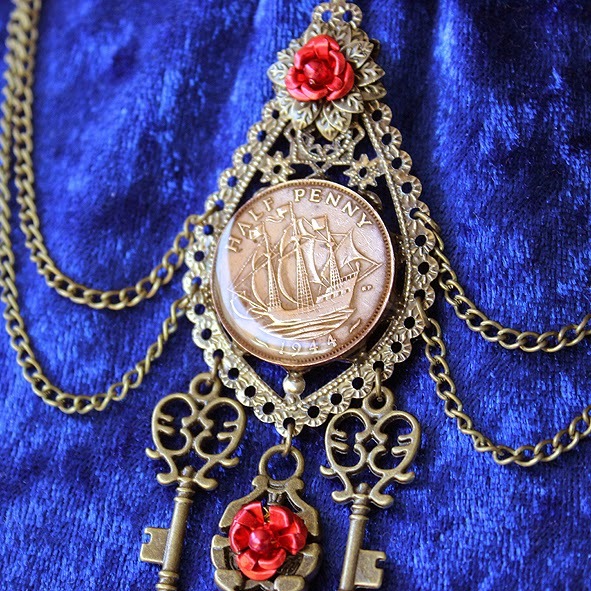 I used to only clean and polish the coins but now I am sealing them with resin to prevent tarnish and to protect them, I have been assured the resin will not harm the coin in any way. The resin also gives a nice dome giving the coin a highlight that wouldn't be possible with only polishing. Gee I was born "last century!!!" 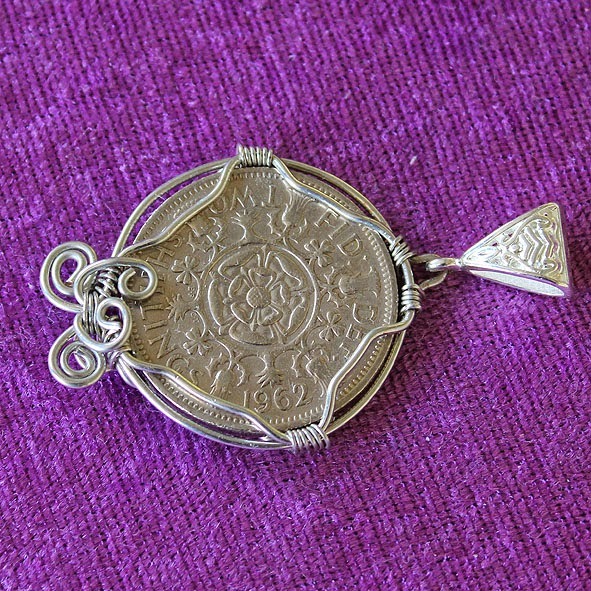 even my granddaughter was born "last century"
I have recently started combining coins with filigree to make necklaces not just pendants, but I will leave that story for the next blog page. Work your Art interview by Debbie. Hello and welcome to another posting for my blog. I was approached a few weeks ago by the lovely Debbie from Work your Art to do an internet interview. I am very pleased to share it with you. 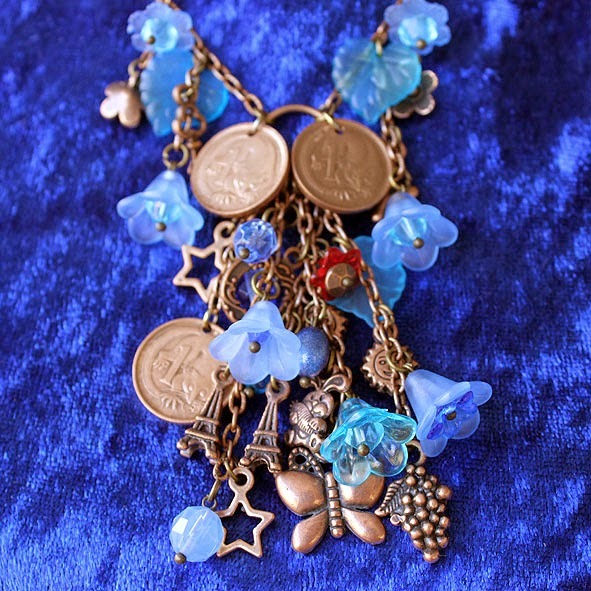 This necklace and earrings feature what was our Australian 1 cent coin with a pygmy possum. We no longer have 1c or 2c coins and there is talk of soon discontinuing our 5c coin as well. 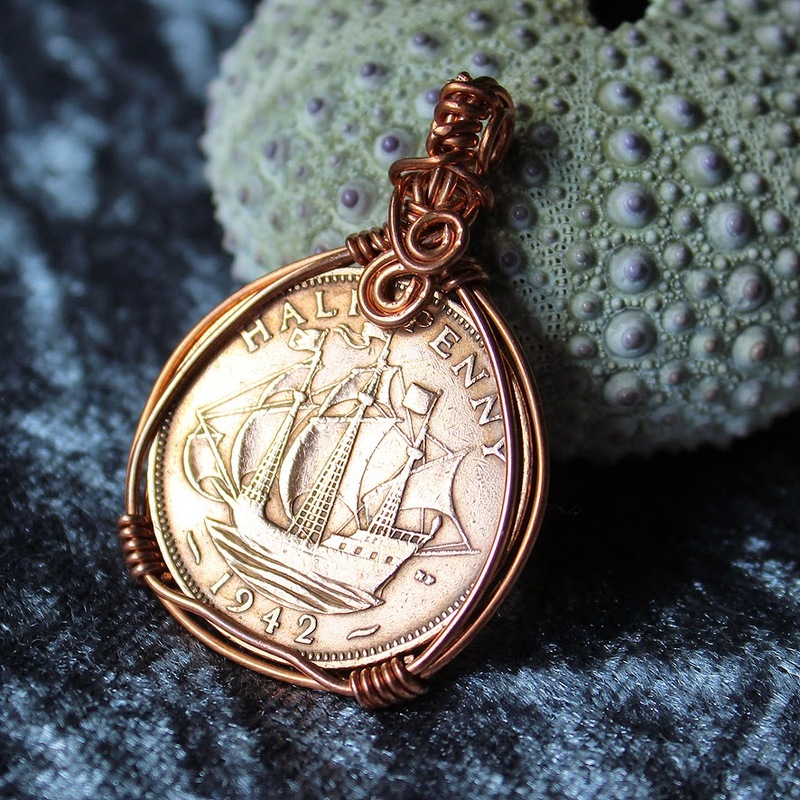 I can't remember how I started working with old coins but they just make me want to do something with them, and I am exploring ways of combining them into Steampunk themed jewellery. Australia didn't have it's own currency until 1910/1911 so prior to then everything is British. 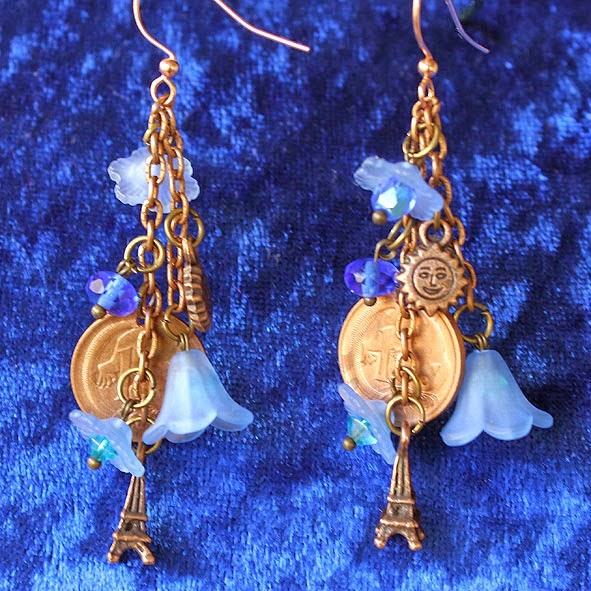 I really love the late 1800's with Queen Victoria as the monarch, and these I feel really suit the steampunk idea especially as one description of steampunk that I have is "Victorian Science fiction"
I was only using filigree and keys but now I am combining cogs and watch parts. Steampunk has really caught my imagination and I hope it becomes more popular as I am seeing more young people getting involved and starting to dress better, get involved in outdoor non violent activities, and start to live adventurous lives. Not only steampunk but Renaissance, pirates, medieval to name a few are becoming popular as we are starting to explore "fun" activities again instead of sitting inside and wondering what to do with ourselves. I have the great pleasure to know a young chap that loves his Steampunk and dresses so at every opportunity. I also have a great Facebook friend that is a mermaid entertainer. I feel better about our future as we start living and enjoying ourselves.